who is going to brazil? Hanging out in Crew Stadium a half an hour after the final whistle, I was there to witness as the US Men’s National Team celebrated officially booking their tickets to World Cup 2014 thanks to a 2-2 tie between Honduras and Panama. Of course, a fourth straight Dos a Cero over the Mexicans was still the highlight of the night. But that didn’t rob the moment of it’s joy or importance: the US would most definitively be going to Brazil. Since then, the Yanks have managed to wrap up top spot in the CONCACAF Hexagonal and locked up an undefeated home record during qualifying, laying to rest several demons in the process. Tonight’s match against Panama will have no bearing on qualification, meaning it’s little more than a formality. But for the players, that couldn’t be farther from the truth. With a handful of prominent players either not called in or sent home due to injuries, that means tonight’s match — along with the bevy of frendlies that will be scheduled between now and next June — provides fringe players with an opportunity to impress manager Jürgen Klinsmann. Perform admirably, and some players could look forward to earning themselves a coveted space in the 23-man roster that will represent our country in Brazil. Perform poorly, and it’s quite possible that all the player will have to look forward to is the bonus appearance check offered by USSF to national team call ups. But the question remains: who will make the cut, and who won’t? And just as I did back in 2009 for the 2010 finals in South Africa, I want to take a stab at guessing the Jürgs’ final roster. These are your guys that, barring death or disastrous injury, will undoubtedly be joining the team in South America next summer. Even if you have just a passing interest in the USMNT, you could probably guess this group. 1. Tim Howard (GK – Everton): His form has been shaky, and the calls for him to his number one shirt have been growing. But if we’ve learned anything from this World Cup Qualifying cycle, it’s that Timmy will likely be the starting keeper for the Yanks. 2. Brad Guzan (GK – Aston Villa): Speaking of form, this guy is in some. Ignoring Christian Benteke for a second, Brad almost-singlehandedly prevented the Villains from being relegated last season. And the fine performances have continued on this term, too. I’ve been calling for him to supplant Howard since the summer, and if things continue as they have, he could very well do so. 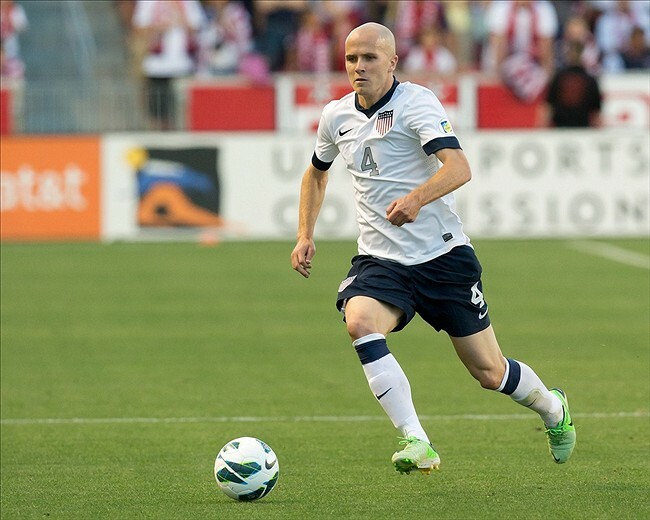 no longer just the coach’s son, bradley has blossomed into the national team’s most important player. 3. Michael Bradley (M – AS Roma): Assuming he was 100% fit and hadn’t been out of action since severely spraining his ankle in Costa Rica last month, Bob’s kid would absolutely be the first player I would give a ticket too. Our best field player by a landslide, the quiet kid from New Jersey will pull all the strings, set the tempo, and lead by example. Here’s hoping there’s no lingering issues with his ankle, as he’s critical to our chances next summer. 4. Jozy Altidore (F – Sunderland): Having seemingly finally unlocked the potential we all hoped he would be capable of, Jozy is now the undisputed number one striker in the player pool these days. He’s been on fire for the ‘Nats in the last six months, and his season last year for Holland’s AZ was a landmark one for Americans abroad. Even if Sunderland continue to leave him alone on an island up top and he doesn’t manage a goal for the rest of the campaign, he’ll be on the flight. 5. Clint Dempsey (M – Seattle Sounders): Having just made a move back to MLS and join the Sounders, Clint has suffered a tumultuous start to his return to the States. He’s been hampered by a series of injuries, and the Sounders themselves have been playing extremely inconsistently. In fact, Deuce really hasn’t had that much of an opportunity to shine since leaving Fulham for Spurs last summer. But despite all of that, his place is still assured unless he can’t shake the injury bug. 6. Landon Donovan (F – Los Angeles Galaxy): Yeah, he opted to take a break from the national team for a while. And true, he’s not quite as dynamic as he used to be. But make no doubt about it: Landon will be in Brazil next summer. Even if in the unlikely event that he’s not a first choice player, he’ll still be on the squad and will make an impact. 7. Jermaine Jones (M – Schalke 04): While he may have three caps for Germany, Jones has made it clear that he bleeds red, white and blue. A favorite of Klinsmann’s, and not just because of their shared heritage, Jones brings a grit to the national team that we’ve long lacked. 8. Geoff Cameron (D – Stoke City): It might seem odd that a player like Cameron — who’s played in like 80 different positions for the US — would be in the guarantees portion of the list. But the Stoke City man’s capability of being the ultimate utility man will ensure his inclusion. Even if that means he’ll be a little upset if he’s not starting at center back every game. 9. DeMarcus Beasley (D – Puebla): If you had asked me four years ago if Beasley would be a shoe-in for this World Cup as a left back, I would have told you to lay off the crack pipe. But the Beas’ renaissance has been one of the stories of this qualification cycle, with Jürgen even going so far as to say he’s locked the position up. They may not be sure things like the group above, but it would be pretty unbelievable if any of the fellas on this list didn’t end up making the trip to Brazil. 10. Omar Gonzalez (D – Los Angeles Galaxy): The Galaxy big man is just on the cusp of edging himself into the top group, but a penchant for niggling injuries only just bumps him down. But assuming he’s fit, he’ll be in the starting XI for the first match of the tournament. 11. Eddie Johnson (F – Seattle Sounders): After nearly fading into obscurity during his very ineffective career in Europe, Johnson has resuscitated his once promising career back in MLS… and with the national team. If Jozy’s not fully raring come next June, Eddie has a shot at nabbing the starting role, too. zusi has seamlessly transitioned into klinsmann’s plans, and provides the kind of service needed to help altidore thrive. 12. Matt Besler (D – Sporting Kansas City): Besler’s rise within the USMNT ranks has been meteoric. And at times during the Gold Cup this past summer, it seemed nearly certain that he and Omar had the starting center back pairing locked down. However, he has a battle on his hands for the other starting spot with Cameron. Though I suspect injuries might dictate how this entire situation pans out. 13. Graham Zusi (M – Sporting Kansas City): Besler’s Sporting KC teammate has also seen his star rise during this qualification cycle, and his displays for both club and country have surely caught the attention of European scouts. If Donovan doesn’t get to start during this World Cup, it will be because of Zusi swiped his spot. 14. Kyle Beckerman (M – Real Salt Lake): Long a shining star in MLS, I worried for a while that the hippy would never be able to replicate that form in US colors. But Beckerman was the star of the show during the Gold Cup, proving that he’s got what it takes at this level. It certainly doesn’t hurt, either, that he’s a favorite of the boss man. 15. Brad Evans (D – Seattle Sounders): The right back spot has proven troublesome for the USMNT in recent years thanks to injuries and inconsistent play. But Evans has recently emerged as viable candidate for the job. 16. Mix Diskerud (M – Rosenborg): Another man whose stock has risen significantly since a series of impressive Gold Cup performances. Mix has stepped up big in the absence of Michael Bradley, proving a worthwhile deputy should one continue to be needed. Even though that most of them could end up making the roster, it’s also quite possible that they won’t be there, too. These guys all face more competition for their places with those in the list to follow. 17. Edgar Castillo (D – Tijuana): A goal and assist against Jamaica on Friday may have finally been enough to convince the manager to keep Castillo around to spell Beasley. the latest “foreign” recruit, johannsson has lit things up in holland recently. 18. Aron Jóhannsson (F – AZ): Though his first start for the Nats last week wasn’t his finest performance, the recently converted Icelander is still one of the most highly touted young strikers in Europe. I love his energy levels, and he looks capable of linking play between the strikers and midfield. 19. Fabian Johnson (M – Hoffenheim): I shocked myself when I made it this far down before placing my second German “American” on the list. But Johnson, like Cameron, makes the roster because of his versatility: he can play left wing, left back and even at right back. 20. Sacha Klejstan (M – Anderlecht): An enigma in that he regularly performs brilliant for his club but poorly for the national team, Klejstan nearly always drives me crazy when he finds his way on to the pitch. But his club form and commitment to the cause are hard to ignore. 21. José Francisco Torres (M – Tigres): Many American fans find him useless, but I love the creativity that Torres is capable of providing… something that is in relatively short supply within our ranks. Though inconsistent in his early appearances for the Yanks, he’s been a far better player in his recent showings. 22. Sean Johnson (GK – Chicago Fire): This is the one I’m most confident I get wrong, as I’m guilty of wishful thinking here. While most would place Real Salt Lake’s Nick Rimando as the third choice in the US keeper pecking order — myself included. But at ten years Rimando’s junior, I’d like to give Johnson the opportunity to see what the World Cup is all about now so he might be better prepared for it down the road. 23. Chris Wondolowski (F – San Jose Earthquakes): While there might be other strikers who offer more, I think Wondo will make the flight simply because he offers something completely different. A big target up top, the Earthquakes front man would allow the US to switch to a completely different strategy than the one utilized with Jozy, EJ or Jóhannsson in instead. These guys are the unlucky few that I suspect will be battling out with the above group for places, and the first three are who I would designate as the “official” alternates. They’re on the cusp, but are lacking something. 24. Hérculez Gómez (F – Tijuana): I debated heavily as to whether I should include Gómez instead of Wondo, as he provides the versatility to lead the attacking line as well as play on the wings. But ultimately, I think we have enough players at our disposal that can play wide, and thus Herc loses out to Wondo due to the reasons already mentioned. 25. Michael Orozco Fiscal (D – Puebla): A year or so ago, Mike would have likely fallen into one of the two groups above this. But thanks to the emergence of Besler, he’s been forced off into the wilderness. He’ll likely have a chance to prove his worth tonight, though. 26. Brad Davis (M – Houston Dynamo): There are a slew of other wide men below that probably deserve a shot for this spot, but Davis playing it in a very traditional sense (hugging the touchline and getting in crosses) gives him the nod in my eyes. 27. Alejandro Bedoya (M – Nantes): Bedoya is one that frustrates, as you can tell when he plays his club football that he has the capability of being a valuable asset. But he just never seems capable of seizing the moment for the USMNT. 28. Timothy Chandler (D – Nürnburg): On talent alone, the German-born Chandler should be in the second top group of this list and should be a near-lock to compete for potentially even a starting spot. But after repeatedly bypassing Klinsmann’s call ups over the last few years, I think Chandler has burned one bridge too many. 29. Terrence Boyd (F – Rapid Wein): Another of the German “Americans”, Boyd is a legitimate talent and one to absolutely keep an eye on for the future. Brazil just so happens to fall a bit too early in his development at this time. 30. Stuart Holden (M – Bolton): The most unlucky man in American soccer, Stu is undoubtedly one of the country’s best players. But he is also the most injury prone talent in our pool since John O’Brien. Even if Holden manages to regain full fitness prior to the roster deadline, the depth of the US central midfield will make his job in making the team that much harder. 31. Steve Cherundulo (D – Hannover 96): Having just returned from a long-term injury layoff, it’s possible Stevie could displace someone like Brad Evans from the roster. However, I worry that Father Time may have finally caught up to the long-serving defender. But if the evergreen Cherundulo does manage to make Klinsmann’s final 23, he’ll be the oldest player on the roster. 32. Brek Shea (M – Stoke City): Once proclaimed as the Gareth Bale of American soccer by some (not me), Shea’s never quite lived up to the lofty expectations placed upon him during his days in Dallas. And unless he manages to crack into Mark Hughes’ Stoke side in the next six months, Brek will miss out on Brazil. Maybe they used to be in the picture, or maybe they didn’t. But I will eat my hat if any of these guys manage to squeeze themselves into the squad. Carlos Bocanegra (D – Chivas USA): The former captain was rather publicly excluded from the national team set up last year, too much furor. But Boca’s best days are long, long behind him. As if playing for Chivas USA wasn’t indication enough. Oguchi Onyewu (D – Unattached): Four years ago he was a AC Milan player; these days he finds himself without a club. Gooch was fabulous in his prime. Problem is, his prime was over four years ago. Freddy Adu (M – Bahia): I promised myself I wouldn’t pick on him, so let’s just say that not playing while on loan in Brazil has diminished his already infinitely slim chances. Well, nearly 2500 words later, and you have my predicted US Soccer roster for the 2014 World Cup in Brazil. Like what you see? Or are you thanking your lucky stars I’ve not managed to be named the manager? Hit up the comments below or drop me a tweet. I’ll be sure to check back in once Klinsmann names his roster and rate my excellence/futility for all to see.